*No Interest if paid in full within 6, 12, 18, 24 or 36 months. Interest will be charged to your Account from the purchase date if the promotional plan balance is not paid in full within the promotional period. Minimum payments are required for each Credit Plan. The sum of the required payments each billing period won't be less than $25 (or Account balance if less). Minimum payments are NOT guaranteed to pay the promotional plan balance within the promotional period. You may have to pay more than the minimum payment to avoid accrued interest charges. Some balances may be paid off before the promotional period ends. Your minimum payment may be higher than if you did not select promotional financing. Valid for single transaction only. Subject to credit approval. As of 04/2019, terms provided for New Accounts: Variable Purchase APR of 29.99% or the purchase APR applicable to your account. Minimum interest charge of $2 per Credit Plan in any billing period in which interest is due. Existing Cardholders: see your credit card agreement for Account terms. 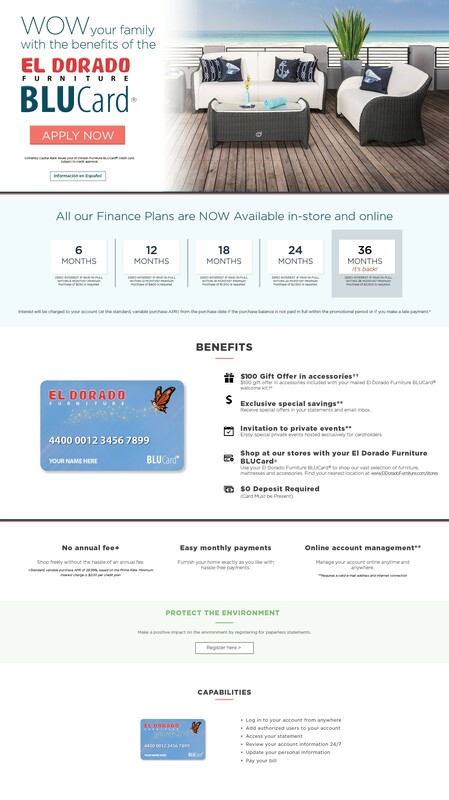 El Dorado Furniture BLUCard® Credit Card Accounts are issued by Comenity Capital Bank.